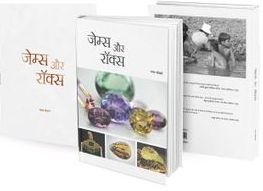 Although there are numerous textbooks on gemmology, mineralogy, minerals, origin, sources, locations, gem species (organic and inorganic), synthetic and treated gem materials, following are the author's personal favourites in understanding the core principles and which have served as 'more often used' references during routine gem identification at the laboratory and for various publications. 'The Bible' for a gemmologist! A photo library of inclusions - their characteristics, classification, formation, identification and much more......A serious gemmologist can't exist without all the three volumes! An emerald celebration - one of the finest descriptive and illustrative information on emeralds - be it technical, practical or a romance! An intriguing portrait of the gemstone cutting industry of Jaipur. Jewelers' Keystone Circular (JCK) from Reed Exhibitions - Reed Elsevier Inc. The Guide from GemWorld International Inc.